sprite-splicing on paint | Welcome to Glitchkill! first, open your sprites in paint. stretch the background out pretty big to get a good enough area to work in. 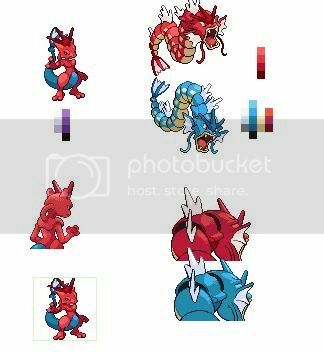 now change the background to some color that contrasts what you plan to work with (ie: red and green pokemon, so use a light blue) you can do this by using the bucket fill tool. now before we start splicing these guys together, were going to need to make them "compatiable" with each other. i like to think of this step as that little toy you have as a kid with the square and round pegs and holes, to teach you that square thigs go in square holes... well, were going to take a grinder and reshape our holes to make 'em fit! zoom in pretty close, click the brush tool, and pick a square shape. now click the color chooser, and then click the darkest color on the first pokemon. now click somewhere with the brush to make a square with that color you just grabbed. now keep doing this until you have ALL of the colors from ALL of the pokemon you have on the "operating table", making yourself a good set of pallettes. now, heres the coolist trick in the book that paint has. on the pokemon that we are "grinding to make compatible", or the one that we want to change the color of, using the color picker, left click the color that you want to change on his pallette. now on the "donor" pallette belonging to the pokemon that were taking parts from, do the same thing with the color picker, but this time RIGHT click the color that we are replacing the old color with. now, take the eraser, set it to the largest size, and RIGTH CLICKING, rub it over the pokemon that we are changing the color of. if should replace everything you touch of the FG color with the BG color. if you dont RIGHT CLICK, then you will EPICALLY FAIL. do this until your pallette has compleatly been changed over from the one to the other. now take the rectangle select tool, select the part of the "donor" Pokemon that you want to slice over to the other, copy, and paste it into the picture. use the eraser (after setting the BG color back to the background you used, that light blue i mentioned ealier) and erase the parts off of it you dont want. like you stole his arm and got a little piece of his side in there, we need to clean that off. now re-select it, set it to the BG transparent thing, and drag and drop it to the "recipient" Pokemon. There you go! the basics of sprite-splicing, done with Pokemon sprites!